One of Iran's top military commanders has said the Islamic Republic will continue to bolster its military capabilities until Israel is destroyed and a Palestinian Arab state established in its place. Brigadier General Mohsen Kazzemeini, a senior commander in the Islamic Revolution Guards Corps (IRGC), was speaking to soldiers during a military drill in Tehran Wednesday. "They (the US and the Zionists) should know that the Islamic Revolution will continue enhancing its preparedness until it overthrows Israel and liberates Palestine," Kazzemeini said, according to the semi-official Fars News Agency. He also indicated Iran would continue its military interventions in surrounding countries, including Syria, Iraq and Yemen, where Iranian proxies and special forces are deeply involved in bloody wars. "We will continue defending not just our own country, but also all the oppressed people of the world, specially those countries that are standing on the forefront of confrontation with the Zionists," Kazzemeini added. He was speaking during a major drill involving some 250,000 Basij paramilitary fighters, as Iran's leaders nervously prepare for the possibility of a military strike by Israel if the nuclear deal signed with western states be formally implemented. Today (Wednesday) that came one step further, as US President Barack Obama gained the necessary support in Congress to ensure the passage of the deal. The nuclear deal is vehemently opposed by Israel, as well as Iran's Sunni Arab neighbors, who fear that it both paves the way to the Shia Islamist regime obtaining nuclear arms and empowers it to escalate support for regional terrorism, via massive sanctions relief amounting to the billions of dollars. 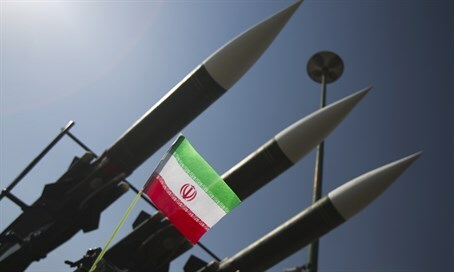 Despite reaching the deal, Iran continues to vent its open hostility to the West and calls for Israel's destruction. On Tuesday, Iran's top religious leader announced that the United States was still the country's "number one enemy," while another senior Iranian official reaffirmed Tehran's commitment to the "annihilation" of Israel. Earlier today, Basij militiamen were on hand in Tehran to unveil a plaque with "100 insults" towards America, outside the site of the former US embassy. The display also involved the public burning of Israeli, American and British flags.